Oh roasted carrots I’ve been missing you my whole life! I had no idea roasting you would create such buttery rich squashy flavor and take garlic to a whole new level of heaven. Why didn’t anyone tell me sooner? Reeni from Cinnamon Spice & Everything Nice I owe you big time for this recipe. It’s a staple in my house already and I’ve made it three times since you posted it. Reeni thought she would add pancetta or bacon next time, and I decided to go the vegetarian route and add peas. I think nearly anything you choose to add to this pasta will be fantastic! 1. Preheat oven to 400 degrees. In a large bowl toss carrot rounds and garlic with the Olive oil, using your hand to thoroughly coat the carrots and garlic with oil. Season well with salt, pepper, and thyme. 2. Bake in a 9x13 inch baking pan about 45-50 minutes until carrots are tender. Take the pan out and toss halfway through the cooking time. 4. In a blender or food processor puree the carrots and garlic together with the heavy cream and Parmesan cheese until smooth. When the pasta is done cooking reserve a cup and a half of the pasta water. 5. Drain pasta and add to a large mixing bowl. 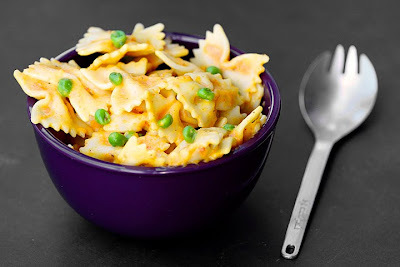 Toss with carrot cream, (add 1 ½ cups frozen petite peas here if using) adding pasta water a little at a time until you get a nice consistency and the pasta is evenly coated. 6. Serve with Parmesan Cheese and crusty bread/garlic bread. Notes: Recently I've been roasting two heads of garlic for this pasta with great results. I guess if this recipe could possibly get any better, garlic would do it. Recipe by Reeni @ Cinnamon Spice & Everything Nice. Picture by Laura Flowers. yum, it looks delish, fresh as a sring day, and since its dark and rainy, thanks for the lift! This is so good, it is the first recipe I have retweeted on Twitter. I hope everyone gets to enjoy it. Oh, yum! This sounds delicious! I must make roasted carrots too! It's one of my all-time favorites too! I love your addition of peas. Thanks for the kudos! Much appreciated. Ciao Laura! buonissima e colorata la tua pasta!! stasera anch'io ho fatto lo stesso tipo di pasta con ragù e besciamella per mia figlia di 4 anni!!! That looks so good! I ♥ roasted garlic and veggies, have never tried carrots before though! Yummy!! This dish looks fantastic! It's so colorful and pretty. I am sure I would like this!The thyme is the clincher..I love roasting root veggies w/ thyme..never added pasta:)Thank you! Hi Laura, this looks great! Another "bucket" recipe. Thanks for stopping by & I hope your mom enjoys the link! Laura, Garlic and cream together in the title caught my eye:) Adding the carrot(roasted) sounds like an interesting addition that I'll have to try! This sounds so good. . I want to make it immediately! This pasta looks really good, I love peas. I too have been thinking about this Bugs Bunny pasta ever since Cinnamon-Girl posted it. It will be next on my list of must try! As I love spices, I would add a touch of cumin to the carrot puree. It is a natural with carrots as it adds a nice depth with hints of lemon. Oh I love simple pasta recipes like this! Looks scrumptious! Looks great! Peas are about to be showing up at our farmers market soon, so I would love to try this! I bet the kids love this one! You know, I don't make enough pasta. It's so good but for some reason I neglect it. I need to add it to my list for next week. Thank-you Katy I'll try that. We added cayenne pepper for a bit of heat with good results on one of the batches too. Oh Laura! This looks yummy, and super easy. Will try this. Roasted carrots and peas in a bowl of pasta sounds simple and delicious. Love the color of this--it looks so good. My nephew would love me for it! --with bugs bunny pasta, of course!! Hi there, Awesome pasta recipe...you have an impressive array of recipes here...loved the post for veg black bean burgers as well...pics look glorious. Wow, this is a new one on me - roasting carrots for a pasta dish. sounds yummy and I want to try it soon. I love the way this sounds & cannot wait to try this soon. Good job. It just sounds so delicious. I will have to try roasted carrots...can't resist! What a great idea! Bet there are myriad variations that could be tried here. I love the idea of the cayenne pepper. And the cumin would be great too... maybe with a few roasted red peppers thrown in! Sounds like a delicious way to incorporate vegetables in a meal! Thanks for finding the recipe and sharing it. I think I will try the bacon version - YUMMY! Love the cute alternate name for the dish, Laura 8). One of the most exciting foodie revelations I've had was when I realized roasting magically makes every vegetable taste amazing. Can't wait to try this! Oven roasting is definitely my preferred method of cooking just about any veg. The flavors are intensified to wonderfully!! i love roasted carrots! this dish was easy and delicious. my blender has disappeared so I could not enjoy the carrot cream, all the same it's great!